In yesterday’s post I wrote about the slew of new daytime talk shows and gave a slight nod to the Katie Couric show. The title of the October 8th show was “To Heaven and Back". Her guests included Dr. Mary Neal, “a woman who spent 15 minutes underwater and lost consciousness", an eleven year old boy, Colton Burpo, who shared his near-death experience, Akiane Kramarik, an art prodigy, who "began to have visions of being in heaven and meeting God" and Theresa Caputo, aka, The Long Island Medium. Katie started off the show by holding up a copy of the October 8th issue of Newsweek. 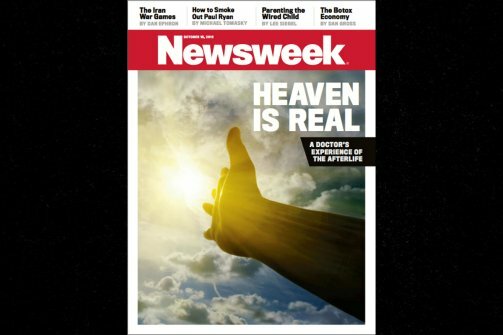 The cover story was "Heaven is Real". This article was written by Dr. Eben Alexander, a neurosurgeon who tells of a journey to the afterlife when he was in a coma. Reader's comments on the Couric show's website and on The Daily Beast dot com, which excerpted the Newsweek article, ranged from blissful acceptance to ridiculing skepticism. On the skepticism scale, with one being mildly skeptic and ten being ridiculing, I would rate myself to be an eight, leaving some room for "anything is possible, I guess". Two of the guests on the Couric show had an effect on me. The first being Theresa Captuo. 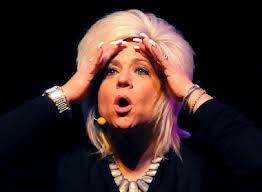 My opinion, regarding the Long Island Medium, is total, all in skeptic. But as I watched her work the crowd, I completely understood why members of the audience were hooked in. With tears in his eyes, a man in the Couric audience, described his mother's last few moments. Caputo assured the man that his mother was right there and wanted him to know that she was okay. I too, found myself wishing it were real. I wandered off and wondered what messages my mother or my son might have for me. The second guest who had an effect on me, or at least lowered my skepticism rating somewhat, was the art prodigy Akiane Kramarik. Her truly amazing skill, at the very very young age of 4, (she is now around 18) was for me, mind blowing. I had a passing thought that maybe there was something to this divine intervention theory after all. I even rewound the DVR to show Ross the remarkable works of this young woman. As I began to write about this, today, I decided to look for a link to her works. I came across this article claiming that the whole thing was a hoax perpetrated by her parents. Apparently, according to the article no one has ever actually seen her paint a piece from start to finish. And as she stated on the Couric show, she has not been able to paint recently because the visions no longer come to her. That's when that niggling, gnawing, nasty little skepticism eyebrow of mine was again again raised. When my mother was in the last stages of her illness, she would constantly ask me if she were dying. I would try to brush off her question with words like, "Oh, Ma, we are all dying." I asked, though, that if she went before me, to please come back and tell me what it is like, to die. My mom died on November 24, 2009. Still waiting, mom. It is so hard for me to accept that my son found a better place to be. He fought so hard to live, to stay here. I am positive he did not want to leave his son, his wife, his family. A few days before he passed away, he promised me that "we still have more time". Just as I am sure that the majority of people want to know that their departed loved ones are okay, I also know that most people are comforted by the promise of seeing their loved ones again in some form of an after-life. Scientists say that energy is indestructible and therefore infinite. So, perhaps, just maybe, the after-life is in the life we give to our children. Perhaps each and all of our experiences, kindnesses, hurts, love, and yes, sometimes even hate become the energies that we pass on to our students, those young ones whom we all encounter during our lifetimes. Before she died, my mom told me that my grandmother was in the room, "right over there, in that corner", she said. I also have had strong experiences of the "presence" of the energies of my grandmother, my parents and my son. And perhaps, just maybe, when my son promised that we "still have more time", he was revealing a greater message to me. Funny thing is, until I meandered around this topic and put it to "paper" I hadn't thought about it that way. And funny, that, if I can believe in that, then it logically follows that my son became the teacher, and I the student. Baby much better today. Kept him indoors all day. Went to bed with him early as no one here. Jean at school and Ted to meeting. I believe in life after death, and I definitely believe in "paranormal" - - including people who can see and talk to the dead. I'm not stupid, and I know there are fakes who try to take advantage of people. But I love Teresa Caputo, and I think she is an amazing woman who gives hope and comfort to some who only hope for hope. Really interesting post! I am a mostly "prove it to me first" type of person. I leave the door open, though, to accept that there are wonders and mysteries of life which cannot be explained. I have always been a bit skeptical about things like this. At the same time, there are things that have happened in my own life that have made me wonder. Yep, there are those little things that do keep me guessing too. Very touching post. After Charlie passed, I went to see John Edward (3) times. He comes to Long Island each Dec. The first time was on the anniversary of his death so I had to go. My two sisters and I go together- one a major skeptic, one complete believer and then me- somewhere in between. After watching and feeling peaceful afterwards, I felt like if it helps them..ok. The third time, he called out my first name (Winifred), I took notice. But, still, wondering. When he mentioned my mother in law by name, and Charlie's exwife by name I was beyond startled. No obit, no creditcard was used etc.. Can't figure out how he "knew". Husband Alan was dating me by then and was upset that I have been "taken", but yet after searches he did online, nothing tied the three unusal names together. I like to think it was him saying hello... My sisters and I will go again sometime. Teresa Caputo is from Long Island as well and I am not sure about her as I have not seen her, but she did walk into our local cupcake place and do an unplanned reading that left the baker speachless. Hope you have a great day! Even though I say I am not a believer, I think part of me is actually a little afraid of this sort of thing. Because I figure, hey you never know. I was very close to my baby sister Evelyn. I was like a mom to her. We were 10 years apart... me being 10 years older. She was diagnosed with myasthenia gravis when she was 29. She had good years and bad. She lived to the age of 42. She spent the last 89 days of her life in the hospital, with a couple of days in a nursing facility (nightmare, don't ask). I was her 'person'. I was her POA for healthcare. I was her oldest sister and she trusted me (most of the time, sometimes she hated me). When the end came, in Feb 2006. we all knew she was dying. Her doctors told us she would not make it through the week. We all gathered around, and held vigil. My husband went to the cafeteria and got her some chocolate cake and some M & M's. I have no idea how many of us slept in that room, but there were 7 siblings at that time. A daughter, an ex-husband, two mothers in law, parents and a special friend. Not to mention in laws. On Friday, Feb 3, 2006, at around noon, the room was full of family and friends. Her pastor was there. She had been in a coma for over 18 hours and had not moved. Just before noon, she raised her arms to the sky. It was the most beautiful thing I had ever seen. The pastor was on one side. I was on the other. Her daughter was sitting by her side. The pastor asked her, "Evelyn? What do you see?" She squinted her eyes as if she were seeing bright lights. She still had her hands reaching above her. I was holding one hand. The pastor held the other. Each time we asked her what do you see? she squinted her eyes and raised her hands as if to reach. Her daughter was only 16 years old. She looked at me and and asked me to take the mask (bi-pap) off her mama's face. She said it was time. I leaned over, and took the mask away. She took one more breath. She looked at me. She closed her eyes and was gone. It was one the the most profound moments of my life. I knew she was okay. I knew she was reaching for something bigger than us. And for people who were waiting for her. Now I truly do not care if anyone believes this. I was there. It had a huge impact on my life. I KNOW that there are beautiful things waiting for us. I have to say, the experience with Nora was not the same.We were not as close. Her circumstance was entirely different. But it was no less life changing. Take nothing for granted. Do not be so quick tgo judge. You just may be enlightened. That must have been so difficult for you. I am sorry that you lost two of your sisters in such a short time. I know that what you described did actually happen. I especially liked that you said you knew she was reaching for something bigger than us. I was comforted by that as I'm sure you were. Thoughtful post, Lynda. I am open to life after death. It certainly makes sense in that energy just doesn't disappear, it transforms. FOr now, since I don't know I do the best I can right here. Good way to look at it, JT. " Do the best you can right here." I like that. I enjoyed the progression through this post and how it brought you around to the words Joe said to you. I remember reading the book about Colton Burpo's experience while we were on vacation at LBI last year and it brought me a lot of peace...not because it told me exactly how "it" goes after death (because I don't think any of us can ever really know that while we are still living on earth), but because it reinforced my belief that what lies beyond is more than our humanity can imagine. It goes back to one of my favorite philosophies about the spiritual - that I don't want to worship a God that's small enough for me to understand completely. I cherish a little spiritual mystery and maybe, whether Joe fully realized it or not, that's what he was communicating - that time perhaps isn't only what we conceive it to be. Lynda, I think your son left you a very powerful message of hope for the future! I know the days get long while we are waiting. My thoughts are with you often, though I don't reply often, I read your posts.